The family that cleans together stays together. Okay, maybe they are just happier because they all work together instead of one person doing everything. 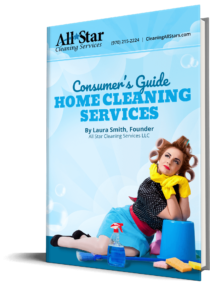 When it comes to getting your kids to do their chores, there are several dos that you should know to be successful. Check out these 7 tips that will help you successfully implement your children’s chores. Start early. Don’t make the mistake of thinking that your toddler is too young to start having regular chores. This is the perfect time to start instilling the importance of contributing to the family. Ease into chores. When it comes to chores, there’s no need to go 0-60. Assign chores a few at a time to keep from overwhelming your child. Don’t insist on perfection. A toddler probably isn’t going to fold towels with smooth lines, and a small child will probably make a few streaks when cleaning a mirror. It’s not about being perfect; it’s about your child contributing to the goals of the family. Praise liberally. A little praise goes a long way. If you let your children know they did a great job with a hug and lots of verbal praise, you don’t need to give an allowance or other rewards for cleaning. Be consistent. It’s easy to slack off on assigning tasks and just do the chore yourself since you can do the task in half the time that a toddler can, but it’s important to be consistent. Children thrive on routine, and after a while chores actually become a habit. Be specific. Instead of saying, “Go clean your room.” Try being specific by saying, “Pick up the books off of your floor, and put them back on your bookshelf.” This is another way to keep from overwhelming your child. An entire room seems daunting, but some books is much more manageable. Be easy with reminders and deadlines. At first it is definitely important to set deadlines for tasks to be done and remind your young child if that task hasn’t been completed in a timely manner. Once your child is older, they should be able to be told once (or check a chore chart) and complete the task on their own without you standing over them. What’s a tip you would give to someone who is getting ready to start assigning chores to their child?